Tips to reduce hair fall in men/hair loss. Every one likes to have the head full of hair to sport with many trendy looks and to increase the beauty. But there are very few men with out a hair problem, whether the improper care, hormonal imbalance, pollution, chemicals in the products or poor diet are taking them to dwell in many kinds of hair problems. In preventing any hair and scalp problem the role played by hair wash is enormous. In many men the root cause of hair fall is improper care towards their hair. If you wash your hair for one time in 15 days or more it leads to the build up of bacteria on the scalp, it also turns on dandruff and revert back with damaging of hair. So, try to rinse your hair for two to three times a week to reduce the risk of infections and flaky skin on the scalp. For the overall proper health and for the healthy hair, vitamins are very necessary. For instance vitamin A stimulates the sebum production in the scalp, vitamin B aids in maintaining the natural hair color, vitamin E boost the blood circulation in the scalp and promotes the production through hair follicles. Limit or quit the consumption of alcohols because it has been linked with the lowering of hair growth. So reduce the alcohols to watch the increase in the hair growth. Some studies have proved the results of hair growth among the people who had tried rubbing the green tea on their hair. Just brew a bag of green tea in half cup of water, let it turn cool. Apply the solution on your hair and leave if for an hour before rinsing it. Do this remedy for once in a week to get the noticeable changes. Divide some time in your day for physical activity. It is your wish whether to exercise, walk, jog or swim for not less than 30 minutes. The regular physical activity reduces the stress levels, maintain the balance of hormones and especially helps in reducing the hair fall. Many medical studies have linked stress with hair fall. So, de-stress yourself with the simple activities like yoga, meditation and breathing exercises. These activities not only reduces the stress but also helps to regulate the hormones in the body. Over sweating in the head is also a cause for hair fall, check yourself when you are developing more sweat. Mostly men with oily hair produce excess sweat in the summer season, to help such conditions rinse your head with aloe vera or neem contained shampoos. They will retain the head cool and restrict the formation of dandruff. Wearing helmet also meets the higher sweat levels, so before wearing a helmet wear a scarf to avoid accumulation of sweat in the hair- one of the major contributor of hair loss due to weakness in hair. 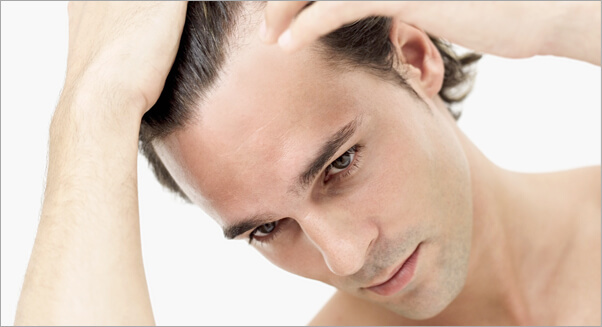 Hair loss in men is a common scenario. This is the reason you should start looking for the best remedies in order to get rid of the situation at the earliest. When you become aged hair fall becomes a usual process. This is when you should take the right measure to control the condition and have proper and thick hair growth. 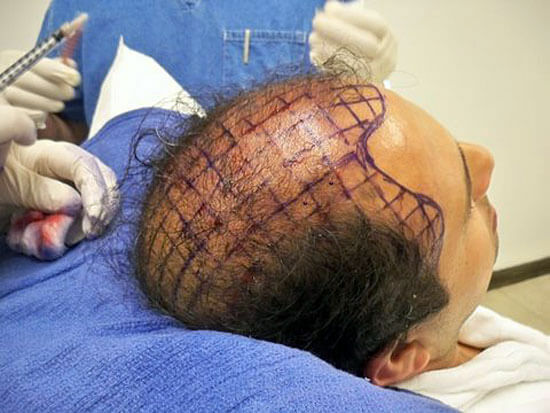 If you want to stop hair loss in men you have to take to scalp massaging. This is the right way you can take care of the scalp and cause proper blood circulation. Blood helps in supplying the right amount of oxygen to the hair follicles and this helps in stimulating and maintaining the growth of the hair. This is the reason regular massaging of the scalp is sure to keep the blood circulation right and in the way the most important elements are brought to the scalp area. Coconut milk comes with all the essential vitamins and nutrients and these are necessary for the perfect growth of the hair. The vitamins and the nutrients can keep the hair follicles healthy and this helps in the proper stimulation and supplies with the right maintenance in case of essential hair growth. You can even have coconut milk in form of drink or with food. This is sure to do good both to the hair and to the skin. Most of the time we eat good things to keep the hair healthy. At the same time it is also important that you apply the right things so that the hair growth is normal and healthy. Egg is something which has the right protein content and it can make the hair strong and thick. So, you can readily make a paste with few eggs and this you should rub on all parts of the hair and wait for few minutes before you wash the same. This is the perfect way you can deliver protein to the hair follicles and help the hair stay in the best of condition. Men need antioxidant protection for the hair. It is best that men eat all the fruits and vegetables that are rich in antioxidants. This acts as a protection against the free radicals. Thus, it is good that you have vegetables and fruits like avocados, bananas, lemon, orange juice and you can even apply honey to all parts of the hair. Honey can be used in the form of hair wash and this is the best ingredient to keep the hair smooth and healthy. The pulp of the fruits too can boost the possible chances of healthy hair growth. To keep the hair in the perfect condition you can make a paste of yogurt and black pepper and this is sure to be the best ingredient for the hair. The paste should be applied to all parts of the hair just like applying shampoo. After you have retained the same for few minutes it is time that you wash off the solution by using a mild shampoo. Vinegar is the perfect choice for the men’s hair. Vinegar has all the advantageous nutrients like potassium and it also has the enzymes that can help in the normal process of hair growth and hair care. Vinegar also helps keep away dandruff. Dandruff can block the hair follicles and it can even get into the pores there by resisting normal hair growth. This is the reason men can use vinegar in order to eliminate the dandruff and make the hair stay clean and healthy. When men have usual hair loss they should stop the intake of red meat. Excess sebum can block the hair follicles and you have the pores getting blocked. If you have an intake of animal fat then there can be excessive sebum production. This is the reason you should limit your level of red meat consumption and this will make you have less sebum production. Now, you are sure to have the right hair growth. The hair will remain normal and there will be no unnecessary clogging of the pores. Inside the intestine you have a typical bacterium called biotin. This is the kind of intestinal bacterium that can help in the increase of the hair growth. You have brown rice and nuts having levels of biotin and so you should add such food to your daily diet. In the way you can have improved and long lasting hair growth. In case you have hypothyroidism it is important that you take to the right treatment. First, you need to increase the level of iodine. For this your diet should includes items like sea vegetables, and these are like kombu, noru, wakame, kelp and the rest. These are rare food items that you can procure and the regular intake of the items can help in increasing and improving the thyroid condition in men. When there is hormonal imbalance it can lead to excessive hair loss. For this it is important that you maintain the right hormonal activity. This will help the hair look great and healthy and there is sure to be less hair fall even when you are aged. Men should know that it is not right to brush the hair when it is wet. The hair in the wet state remains weak and so it should not be addressed then and there. In case you have no option then you should brush the wet hair using wide toothed comb. It is also important that you don’t brush the hair too often. Too much handling of the hair can cause hair loss. However, before you start brushing the hair it is necessary that you untangle the hair well by using the fingers. This makes the comb run smoothly through the hair and you face fewer problems in handling the hair the right way.